QuickBooks Enterprise is a financial services software that offers end-to-end accounting solutions without the need for ERP implementation. Designed for growing businesses and non-profit organizations, QuickBooks Enterprise provides a dedicated accounting platform to integrate tasks like payroll, payables, inventory tracking, and more into. Despite being a stand-alone system, QuickBooks Enterprise offers advanced features and functionalities that can be tailored according to the type of industry your business caters to, notably manufacturing, wholesalers, and construction segments. Some of these more complex processes and features include advanced pricing, payroll, and inventory tracking. Also added are more data capacity, more sophisticated inventory management, and multiple entities support along with the same feature set consolidation and same navigational scheme and user interface found in other Intuit’s products. QuickBooks Enterprise targets mid-sized businesses that have outgrown QuickBooks or other entry-level accounting platforms. However, the enterprise edition keeps the simplified language and easy-to-read user interface and navigational tools of its predecessor, making it ideal for non-accountants. QuickBooks Enterprise is typically sold as an all-in-one package, including features like Reporting & Finances, Inventory, Sales & Customers, Purchasing & Vendors, and Payroll & Employees. A cloud hosting option is available to take QuickBooks Enterprise to the field. There are also other versions of QuickBooks offered (both cloud-based and on-premise). You can find more details about these in our QuickBooks reviews section. QuickBooks Enterprise has an Income Tracker to give you an end-to-end view of all income-related transactions in one place. It also allows you to input expense transactions fast, with transactions from multiple banks and accounts in one place. Likewise, you can save formatting to cut time and export your QuickBooks reports to Excel by simply refreshing your previously saved worksheet and your formats will be applied to the new report. Furthermore, you can access industry-specific report templates created by other QuickBooks users, while the Company Snapshot helps you stay on top of your business from a single screen, with data presented just the way you want it. The software also allows the use of any Enterprise Solutions’ 138+ standard reports, such as Profit and Loss, Forecast vs. Actual Budget, Statement of Cash Flows, A/R Aging Detail and Customer Average Days to Pay, to get real-time visibility into your business performance. QuickBooks Enterprise helps you build all subassemblies automatically with a final build, instead of entering them individually. There are no more worrying about minimum or maximum stock levels; likewise, you can create thousands of advanced price rules based on any combination of customers, items, vendors, and more. Accurate automatic data entry accomplished through scanning inventory and serial numbers. You can track reps by job and use customizable purchase forms to view expenses by rep, and save time and improve accuracy by assigning default classes to items, accounts or names. Moreover, you can track and follow up on sales leads in the new QuickBooks Lead Center. QuickBooks Enterprise’s Purchasing & Vendors module is robust. The stock status reports show you which items you need to reorder and you can assign default classes to items, accounts or names to cut time and improve accuracy. Likewise, you can invoice multiple customers for time and expenses in one batch, and give your business room to grow with the capacity to add and track hundreds of thousands of vendors. QuickBooks Enterprise has higher list limits. You can also see invoices, billing, past transactions, and other important tasks coming due or past due in the Calendar view, or organize by scanning and attaching receipts, estimates and other important business documents to your QuickBooks records with drag and drop ease. Furthermore, the software does your most frequent and time-consuming tasks for you, such as: find items in your sales order based on item detail, including custom fields, directly from your sales order, invoice, or sales receipt. Likewise, QuickBooks Enterprise Solutions supports 1 user to 30 simultaneous users, scaling with your business as it grows. Every enterprise is different, and can need a particular type of Accounting Software solution that will be fit for their company size, type of clients and employees and even specific industry they cater to. We advise you don't count on getting an ideal services that will work for every business no matter what their history is. It may be a good idea to read a few QuickBooks Enterprise reviews first and even then you should keep in mind what the solution is supposed to do for your business and your employees. Do you need an easy and straightforward solution with just basic functions? Will you actually use the complex functionalities required by experts and large enterprises? Are there any specific features that are especially useful for the industry you work in? If you ask yourself these questions it is going to be much easier to get a trustworthy solution that will fit your budget. 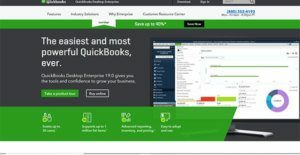 How Much Does QuickBooks Enterprise Cost? We realize that when you make a decision to buy Accounting Software it’s important not only to see how experts evaluate it in their reviews, but also to find out if the real people and companies that buy it are actually satisfied with the product. That’s why we’ve created our behavior-based Customer Satisfaction Algorithm™ that gathers customer reviews, comments and QuickBooks Enterprise reviews across a wide range of social media sites. The data is then presented in an easy to digest form showing how many people had positive and negative experience with QuickBooks Enterprise. With that information at hand you should be equipped to make an informed buying decision that you won’t regret. What are QuickBooks Enterprise pricing details? What integrations are available for QuickBooks Enterprise? App integration with QuickBooks POS v18.0. Pros: I love that QuickBooks Enterprise integrates smoothly with the other apps I use which saves money and time. Plus, the system offers sophisticated inventory features that help you to easily manage all stages of the inventory lifecycle. Cons: I have no complaints about QuickBooks Enterprise and I heartily recommend this solution to all prospective users. Pros: I love that QuickBooks Enterprise is so easy to use. It offers a larger database than other QB solutions and hence is a good app for big companies as it can manage a higher volume of inventory items, bills, invoices, etc. Cons: The major negative is it is difficult to make changes to the data and historical info. However, this is an internal control problem of the company. If you need more information about QuickBooks Enterprise or you simply have a question let us know what you need and we’ll forward your request directly to the vendor.